How the Grinch Stole Christmas! (also known as Dr. Seuss' How the Grinch Stole Christmas!) is a television special directed and co-produced by Chuck Jones. It is based on the eponymous children's book by Dr. Seuss, the story of the Grinch trying to take away Christmas from the townsfolk of Whoville below his mountain hideaway. Originally telecast in the United States on CBS on December 18, 1966, it went on to become a perennial holiday special. The special also features the voice of Boris Karloff as the Grinch and the narrator. The Grinch (voiced by Boris Karloff) is the film's main character. He lives alone in a cave atop Mt. Crumpit, located above the village of Whoville. The Grinch is a surly, anti-sociable character with a heart "two sizes too small" who has especially hated Christmas for 53 years. He hates the noise, the gluttony, and the sickening Christmas music. One Christmas Eve, he finally has enough and decides to stop Christmas Day from coming to Whoville at all. The Grinch makes himself a Santa-style coat and hat, to disguise himself as the real thing. He also disguises his dog Max as a reindeer. The Grinch then loads empty bags onto a sleigh and travels to Whoville in the night. Acting as an anti-Santa Claus, he takes everything Christmas-themed in the house. In so doing, he's almost caught by Cindy Lou Who (voiced by an uncredited June Foray), a toddler Who girl who wakes up and sees him taking the Christmas tree. Pretending to be Santa, the Grinch tells Cindy Lou that he is merely taking the tree to his workshop for repairs, and then gets her a drink before sending her back to bed. He empties the first house of all the Christmas-related items, then repeats the process at the other houses in Whoville. With the Whos' stolen Christmas goods, the Grinch and Max travel back up Mt. Crumpit. Before dropping the loaded sleigh off the mountain, the Grinch listens, excitedly, to hear cries of anguish from the Whos when they wake to discover their losses. However, down in the village, the Whos joyously begin to sing Christmas carols as though nothing had happened, proving that the spirit of Christmas does not depend on material things. The Grinch is, at first, extremely confused, and then begins to understand the true meaning of Christmas. Just as the stolen Christmas presents begin to slip off the mountain edge, the Grinch rushes to save them. His heart grows three sizes, granting him "the strength of ten Grinches, plus two! ", which he needs to lift the sleigh to safety. He brings everything back to the Whos and participates in the holiday feast. He is given the honour of carving the roast beast, and Max gets the first slice for all his troubles. Director Chuck Jones and children's-book author Ted Geisel (Dr. Seuss) had worked together on the Private Snafu training cartoons at Warner Bros. Cartoons during World War II. Jones was interested in adapting one of Geisel's books into a television special and approached him to turn How the Grinch Stole Christmas! into one in time for the holiday season. Although Geisel was initially reluctant due to his unpleasant experiences making the film The 5,000 Fingers of Dr. T., he eventually agreed. How the Grinch Stole Christmas! was produced by The Cat in the Hat Productions in association with the television and animation divisions of Metro-Goldwyn-Mayer Studios, where Jones was under contract at the time. CBS, coming off the surprise success of A Charlie Brown Christmas a year before, allotted Jones and MGM a $315,000 budget, more than four times what Bill Melendez was offered to produce A Charlie Brown Christmas. The original broadcast was sponsored by the Foundation for Full Service Banks whose sponsor plugs within the original airing were later edited out for subsequent broadcasts. The entirety of the book's text, with some slight embellishment, was adapted into the special; to pad the special to a full 30-minute time slot, songs and animated sequences without words (the longest being an extended scene in which the Grinch and Max comically descend into Whoville) were added. 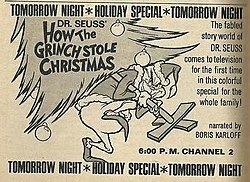 As all the major networks had flipped to full color schedules by 1966, the special was likewise produced in color, establishing the Grinch's color (white in the two-tone illustrations of the original book) as green, a convention used in later television specials featuring the character as well as the 2000 and 2018 film adaptations. The half-hour (with commercials) short was originally telecast in the United States on CBS on December 18, 1966. CBS repeated it annually during the Christmas season until 1988. It was then aired on various other networks multiple times a season. In the 1990s and 2000s, it was primarily seen on Turner-owned properties (TBS, TNT, and Cartoon Network), and later ABC from 2006 to 2014. On August 13, 2015, NBC announced that the special would move to that network, which would air it twice during the Christmas season under a three-year licensing deal with Warner Bros. Domestic Television Distribution. The special was released in the midst of a wave of animated holiday specials, joining a number of other 1960s productions (such as 1964's Rudolph the Red-Nosed Reindeer, 1965's A Charlie Brown Christmas and 1969's Frosty the Snowman) that have come to be regarded as classics. It received modestly positive reviews at the time it was released. Critic Rick Du Brow said it was "probably as good as most of the other holiday cartoons." It has since been recognized as a classic, with Rotten Tomatoes giving it a 100% "fresh" rating on its website; the critical consensus reads, "How the Grinch Stole Christmas brings an impressive array of talent to bear on an adaptation that honors a classic holiday story – and has rightfully become a yuletide tradition of its own." The special continues to be popular in Nielsen Ratings, with its 2010 airing (the last of many times it had aired that year) winning its time slot among persons 18 to 49 and finishing second in overall viewers. TV Guide ranked the special No. 1 on its 10 Best Family Holiday Specials list. How the Grinch Stole Christmas! was released to VHS, Betamax, CED, and LaserDisc by MGM/UA Home Video in the 1980s, and was reissued several times. The special was first released to the VHS and DVD formats in 1999 and 2000 by Warner Home Video, which acquired the rights to the MGM library in the late 1990s. The DVD release featured another Seuss-based special, Horton Hears a Who!, and contained an audio commentary by Phil Roman and June Foray, interviews with Albert Hague and Thurl Ravenscroft, and the "Special Edition" documentary which aired alongside the special on TNT in 1994. The DVD was well-received for these bonus features, but also criticized for its sub-par picture quality; many critics pointed out that the Grinch looked yellow, not green, in this release. The special was re-released on DVD in 2006 and labeled as a "50th Birthday Deluxe Edition". That labeling refers to the 1957 date of the book's publication rather than to the date of the 1966 TV special. This DVD release featured a new retrospective featurette and contained all the bonus features from the previous release, except for the audio commentary, and the Grinch was restored to his original green color. This edition is also available as part of the four-disc Classic Christmas Favorites box set. The special was again re-released on DVD with Phil Roman's and June Foray's audio commentary replacing the Horton Hears a Who! bonus special. The special was released on high definition Blu-ray Disc in 2009 with the title changed to Dr. Seuss' How the Grinch Stole Christmas! It contained all the bonus features from the 2000 DVD, except for Horton Hears a Who!, and also included a DVD of the special and a Digital Copy. Three songs with lyrics were included in the special: "Welcome Christmas," "Trim up the Tree" and "You're a Mean One, Mr. Grinch." The last of these was performed by Thurl Ravenscroft; the other two were performed by a chorus representing the voices of the Whos. None of the vocalists were credited at the time. On December 18, 1966, MGM released a soundtrack LP in conjunction with the television special. CD releases include albums produced by Island (1995) and Mercury Records. In the recorded version, Boris Karloff does all voices including Cindy Lou Who. The song "You're a Mean One, Mr. Grinch", which comically describes the level of the Grinch's despicable nature, includes all verses with their original rhyming lyrics and the isolated song tracks have different durations due to being re-recorded. On October 5, 1999, Rhino Entertainment released a new CD soundtrack (which included the soundtrack for another Dr. Seuss cartoon, Horton Hears a Who). Both story collections contain selected dialogue and music numbers. The "isolated music tracks" in this edition are taken directly from the television soundtrack and are not the re-recorded tracks from earlier versions. The dialogues are the originals, being voiced by Boris Karloff for "Grinch" and Hans Conried for "Horton." Because Thurl Ravenscroft was not credited in the closing credits of the 1966 television special as singing the song "You're a Mean One, Mr. Grinch", it is sometimes attributed to Boris Karloff. After becoming aware of this oversight, Seuss himself called Ravenscroft and apologized profusely and later wrote letters to columnists nationwide telling them that it was Ravenscroft who provided vocals for the musical number. Karloff received a Grammy Award in the Spoken Word category—the only major performing award of his career—for the album. A television special called Halloween Is Grinch Night, created by DePatie-Freleng Enterprises, aired on ABC in 1977, eleven years after the Christmas special. This special involved a tale of the Grinch coming down to scare the Whos every Halloween. Though less successful than the original, it was awarded an Emmy. A later cartoon, The Grinch Grinches the Cat in the Hat (alternatively titled The Cat in the Hat Gets Grinched), aired on ABC in 1982. Though credited to DePatie-Freleng, it was produced by Marvel Productions, which had taken over DePatie-Freleng in 1981. ^ a b McCracken, Elizabeth (December 25, 2005). "Our Cereal Hero". New York Times. Retrieved December 24, 2014. ^ a b Grinch at Don Markstein's Toonopedia. Archived from the original on February 5, 2016. ^ "UPDATE / Lee Margulies". latimes.com. November 27, 2016. Retrieved November 27, 2016. ^ "'How The Grinch Stole Christmas' Animated Special Moves To NBC – TCA". Deadline Hollywood. August 13, 2015. Retrieved August 14, 2015. ^ Rick Du Brow (December 19, 1966). "Christmas 'Theft' A Charming Hour". Beaver County Times. Retrieved December 23, 2012. ^ "How the Grinch Stole Christmas". Rotten Tomatoes. Retrieved December 15, 2011. ^ TV Guide Guide to TV. Barnes and Noble. 2004. p. 574. ISBN 978-0-7607-5634-8. ^ "DVD Movie Guide: Dr. Seuss' How the Grinch Stole Christmas/Horton Hears A Who! : Special Edition (1966) review". Dvdmg.com. Retrieved December 15, 2011. ^ "DVD Movie Guide: Dr. Seuss' How the Grinch Stole Christmas/Horton Hears A Who! : 50th Birthday Deluxe Edition (1966) review". Dvdmg.com. Retrieved December 15, 2011. ^ "WHV Press Release: Seasonal Family Classics Combo Packs (Blu-ray)". Hometheaterforum.com. July 14, 2009. Retrieved December 15, 2011. ^ "Boris Karloff (British actor) – Encyclopædia Britannica". Britannica.com. March 18, 2014. Retrieved August 18, 2014. ^ "Primetime Emmy® Award Database | Emmys.com". Cdn.emmys.tv. Retrieved December 15, 2011.